December 4, 2018, Dept. of CE, BUET. Department of Civil Engineering of BUET accorded a reception to National Professor Jamilur Reza Choudhury on 4th December 2018 in its seminar room. The program was attended by special guests and former distinguished faculties of Civil Engineering Dept. – Prof. Dr. Sohrabuddin Ahmad, Prof. Dr. Alamgir Habib, Prfo. Dr. M. Shamim Z. Bosunia, Prof. Dr. Alee Murtuza, Prof. Dr. AMM Safiullah, Prof. Dr. Alamgir Mujibul Hoque, Prof. Dr. M. Feroze Ahmed and others. 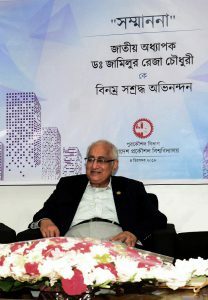 The program was chaired by Prof. Dr. Ahsanul Kabir, Head of the Department. Earlier the Govt. of Bangladesh appointed Prof. Jamilur Reza Choudhury as a National Professor along with two others – Professor Rafiqul Islam and Professor Anisuzzaman. Prof. Jamilur Reza Choudhury is an alumnus and a former faculty of the Dept. of Civil Engineering who is considered as the most eminent personality in engineering community of Bangladesh. He plays a cardinal role in development of the infrastructure system of Bangladesh. He is an internationally recognized civil engineer, educationist, researcher, administrator and a leader.